The national Mortgage Bankers Association (MBA) offered the real estate market a breath of spring last week. According to the association’s Market Composite Index, more people applied for home loans during the week ending March 26 than for any other similar period in the last six months. The weekly survey of mortgage applications is one of the earliest measures of the health of the housing market. Not only do mortgage applications estimate sales that could potentially close in the future, but the data comes out well before similar surveys tracking the pace of housing sales are released. The latest MBA survey provides one of the only market indicators currently available on housing activity occurring in late March. 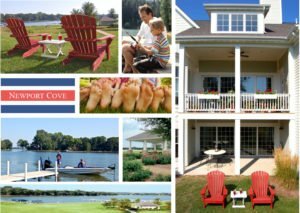 At Newport Cove, New American Homes’ waterfront community on the Chain O’ Lakes, sales have been picking up. So far this year the Newport Cove sales team has written three contracts (and closed on one) – well ahead of the sales pace of 2009.